This soundtrack is way more punchy than the last one, and in some ways Williams is returning to form here. The mix doesn’t sound quite as dry as TFA which I like. Rose’s theme is very nice, I hope her character deserves it. Yoda’s theme…. well I guess I’m spoiled now. Looking forward to that scene. There’s a lot more “magic” in the orchestration this time around, more glossy flutes and bells which is definitely welcome. Apparently this movie has a lot more metaphysical stuff that happens in it which I’m looking forward to. Luke and Leia’s theme making a return makes me wonder if they’ll see each other again or… worse it’s as close as we’ll ever get to that happening. I’m scared for the fate of Luke now. This is kind of choppy, not very smooth and organic. There’s a big rendition of Kylo Ren’s theme, a nice rendition of the March of the Resistance, and a bit that reminds me of Finn’s Theme, at least the rhythm of it. Lots of brass fanfares in this track. Snoke’s theme from TFA returns, the same guttural singing as before. Both of Kylo Ren’s themes are featured prominently too. More Kylo Ren’s theme! Neat, shortened variation this time. Then a really neat, big rendition of March of the Resistance, totally new variation and not just a retread of a TFA variation. The middle of the track is action music, and it gives way to a really nifty, slow, unique rendition of Princess Leia’s Theme. Really cool! Then after a dark interlude, another brand new, really unique rendition of Leia’s theme again gives way to a blend of The Force Theme with Leia’s Theme. Wow! The very end of the track features a brand new variation of the first 6 notes of Rey’s Theme. This opens with the introduction (on album) of Rose’s Theme, which gives way to another new, nifty rendition of the Resistance March. Soon we get Leia’s Theme again, sounding a bit quiet and subdued, but not in the same way as in the previous track. Then more Resistance March stuff to end the track. Despite the title, this is certainly not a concert arrangement. Opens with a nice new rendition of the Force theme. Then we finally get Luke’s Theme, and its an awesome quiet version, somewhat similar to when he appears in the rebel briefing room in ROTJ, but definitely new. This gives way to more Leia’s Theme, and we get new variations of Rey’s Theme, too. Second half of the track is kind of different from the first half… features some nifty Williams mystery writing, not sure if its a new theme of any kind though. The track ends with more Force Theme. This entire track could be a concert arrangement for sure. It features Rose’s Theme prominently to start, but then gives way to some brass fanfare medley that repeats a few times, back to Rose’s Theme, back to the brass fanfare… back to Rose’s Theme and ends in a very concert arrangement-y way. Finally features a long rendition of Rey’s Theme for the first time on album – a neat, new variation, too! more Force Theme as well. I like this track, has a nice mystery feel in between all the action music. So this is a 40 second score cue (Some nice “landing on a planet” music from Williams), which has a source cue mixed over the ending beginning at 0:35 that runs from then till the end of the track. Features steel drums and other instrumentation that’s just like Cantina Band, something that sounds like a kazoo, some other alien sounding synths, the whole thing has a jazzy feel like Cantina Band. Also features a non-Williams theme briefly that’s been used in cartoons and stuff (apologies for not knowing the name of it). More Rey’s Theme, then a lot of mystery underscoring. We start to get hints of the Rebel Fanfare about 2 minutes in, and soon get a fanfaric rendition of Luke’s Theme, which is followed by a brief Kylo Ren theme rendition. The fastest, most frenetic action track of the OST album. Features two cool rendition of Rose’s Theme! Probably the least interesting track of the album, right? Not too much here to talk about. I guess the sad version of Rey’s Theme towards the end is pretty neat. A long buildup that finally gives way to a big rendition of the Force Theme! More subdued Force Theme later, then the ending of the track is a bit awkward… basically we just suddenly and kind of randomly get Yoda’s theme, but not a cool new rendition, its basically just the concert arrangement ending from TESB. Oh well. A small bit of Snoke’s Theme here, and eventually a big brassy rendition of The Force theme… I think it reminded me of a ROTS rendition? Then some action material that was also prequel-esque, that eventually has a neat percussion instrument under part of it. Rey’s Theme enters in a cool way back by some trumpet blasts, and then we get some AOTC-esque tribal drums too. Towards the end the violins do a run I think I recognized from somewhere else. Kind of a disappointing action track – I think the best way to describe it is that it lacks focus, kind of jumping all over the place in its short runtime. Rebel Fanfare makes a neat cameo, and there are some cool drums here too (kind of prequel-esque). The last fifteen seconds feature a repeating melody that reminds me of the opening space battle music from ROTS. It features the Force Theme, the Resistance March, the Rebel Fanfare, reworked bits of TIE Fighter Attack from ANH, but unlike track#1 which was kind of a mess, its very much organic and organized here. Probably the best action track on the album. Ends with some nice choir! I guess the highlight of this track is a nice, slow, long rendition of Luke and Leia’s Theme. It’s not exactly like a ROTJ iteration, but its not wildly different either. This gives way to Han Solo and the Princess very briefly, and then then we transition to some dark music whose rhythm seems based on the Imperial March, but the main brass melody is something else. For a track with this title I was expecting it to be a highlight o the OST, but it really isn’t. It features some choir which is nice, but not much else in this track grabbed me. Maybe knowing what scene its for later will help. Opens with a big, sweeping rendition of the Force Theme. But then we get some underscore with that march-like bit that we’ve heard before, Kylo Ren’s theme…. nothing too special. But then towards the end of the track there’s a really neat new quiet version of the Force Theme, which gradually grows bigger, and then the Rebel Fanfare comes in to end the track in a really fun way! 0:00-1:05 is the final cue from the movie (I assume), and once again ends with The Force Theme. Before the Force Theme comes in, we get 30 seconds of kind of unique music, twinkly kind of stuff that eventually features Luke’s Theme, but then a dark interruption before the Force theme. Kinda weird. 1:05-1:50 is the standard end credits opening with Luke’s Theme, Rebel Fanfare, etc. 1:50-end is the end credits medley, and it really isn’t nearly as good as TFA’s. 2:40-2:55 is an all new piano rendition of Leia’s theme, which is great! But its WAY TOO SHORT!!! Maybe its this way because this is when Carrie’s dedication is on screen or something…. 2:55-3:44 is I think that brass melody from The Rebellion is Reborn? Not sure. 3:44-4:42 is a cool medley of the March of the Resistance, Rose’s theme, the Rebel Fanfare, and Rey’s theme. 4:42-5:31 Yoda’s Theme, not really different from TESB end credits rendition. 6:57-7:27 TIE Fighter Attack from ANH with some new bits inserted. Good stuff! I guess the end credits are growing on me, lol. The music in the medley is good, just some of the transitions are awkward, especially going into and out of that way-too-short Leia’s Theme on piano bit. I wish that part was much longer! Definitely agree that it is a little choppy. I like the brass writing though, especially that brief moment with March of the Resistance. Really like the tense strained chords at 5:14. A fun track. Nice return of The Jedi Steps although not hugely different to TFA. To be honest, I’m not as disappointed as some people that this theme hasn’t returned to a greater extent. I never expected it to be a new theme for Luke but rather a location theme for that island. It would have been almost impossible to top its rendition from TFA anyway. Overall, a nice track particularly the ending. A collection of the “villains’’ themes. Not too much to say about that. Love the rapid fire version of Ren’s theme at the very start on brass. I also like the completely new variation of the Resistance March. After that, Ren’s theme over the action ostinato sounds really cool. That eerie version of Leia’s theme sounds both wonderful and very unusual. I love how it gives way to a full bodied version of her theme. One of my favourite tracks, full of cool thematic usage. As with most other people here, I instantly fell in love with Rose’s theme. It sounds gorgeous in its first quote here. Also I really like the sprightly renditions of the Resistance March. Another nice track. Really cute version of Luke theme here. I quite like the mystery stuff near the end. Sounds like it is straight from AOTC but in a good way. Those brass / woodwind interludes are nice, I just wish Rose’s Theme was given more of a chance to flourish and shine over a longer and sustained period of time. Therefore, I can’t consider this to be truly a concert arrangement of Rose’s Theme. Still a great piece of music though, and that ending is powerful. Mostly Rey’s Theme followed by the Force theme. Both fairly subdued but still a nice listen. Wow, who would have thought an 85 year old Willams would have this in him. It is a pretty crazy soundscape. I don’t like it as much as the cantina material from ANH, but he definitely had fun writing it. Wow, I love what JW is doing here. It sounds like the swashbuckling music from Tintin but more frenzied and less poised. And Rose’s theme in action mode sounds amazing. A definite highlight of the sequel trilogy so far. Again, not much of interest here except more subdued Rey’s theme at the end. A pretty typical but decent modern Williams action track with some cool renditions of Rey’s theme. A completely uninteresting action track. Aside from a very brief quote of the rebel fanfare, it is entirely non-thematic and the orchestra isn’t really doing anything engaging except for random brass and percussion hits. On the other hand, The Battle of Crait is the complete opposite of Chrome Dome. It is a fabulous action track which is full of different themes in action mode. My goodness, Rose’s Theme at 0:48 sounds so wonderful. I love the rapid fire material at 1:53 which returns at 2:34, and at 3:06 with Rey’s Theme this time. The TIE fighter material isn’t a direct copy of ANH and has enough variation to keep me interested, especially the elongated note of the rebel fanfare at 4:22. I also like the tension build-up from 5:29. Overall, really great action writing. Loads of cool little moments. After some quotes of OT themes, the ending sounds so dark and epic. I love that rhythm in the second half of the cue. No doubt it scores a very dramatic scene. It is big and dramatic with wordless choir but nothing too special. Some nice quotes of new and old themes with a very big rendition of the rebel fanfare at the end. Not much else to say about this but I like it. The first 30 seconds of twinkly material is nice but pretty unusual especially how it segues into Luke’s theme. I guess it will make sense in the film. 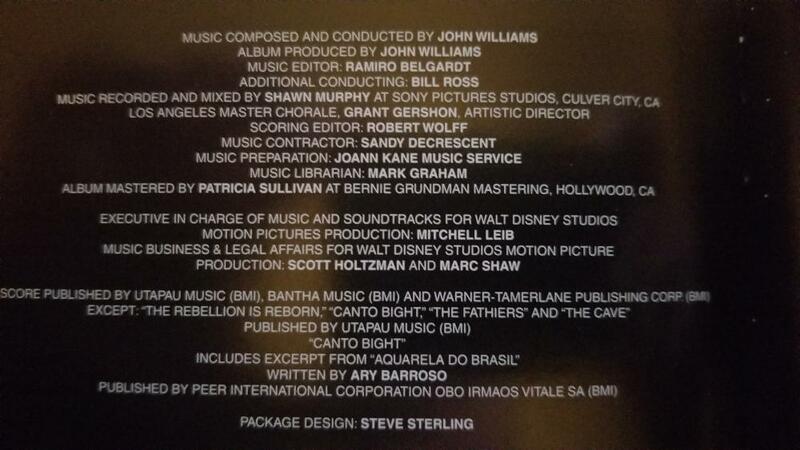 The rest of the end credits features great renditions of the themes but the transitions are very very messy. Just when you think Rose’s Theme is going to take flight for full orchestra, it suddenly stops cold to give way to Leia’s theme on piano. In fact, the worst transactions are between the OT material and the new themes. It is a shame, especially since TFA had one of the best end credits in the franchise and this one actually ends with a cool version of Rey’s theme. I realize the inherent bias in comparing this brand new score to The Force Awakens, which I’ve known and loved for two years. I do think TFA is more emotionally resonant and nothing on this new album matches the sustained high quality of The Ways of the Force through to Jedi Steps and Finale. The lack of a proper concert suite for Rose is disappointing because it is a fantastic theme; and the end credit construction is a mess. There is also a higher number of uninteresting tracks on this album compared to TFA. That being said, there are plenty of highlights and the action scoring in general beats Follow Me / The Falcon and The Rathtars, both of which are still great cues. And of course, Rose’s Theme is a gem. I predict there are a few great cues missing from the OST which will hopefully find there way onto the FYC. If TFA is a 5 star score, I’d rate TLJ 4 stars but I need further listens to properly digest it to figure out where it stands within the franchise.